Estonian Tõnu Tõniste on Lenny, confirmed his victory in the first Melges 24 European Sailing Series event of the season with an eleven point margin. Tõniste finished ahead of Italian Niccolo Bertola on Taki 4, and Sergio Caramel on Arkanoe by Montura who completed the podium – both in overall and Corinthian rankings. Sunday morning in Portoroz was nice and sunny, but not very windy and only one race was completed before the wind failed completely. The light conditions favoured the stalwart of the class from Germany, Eddy Eich’s Musto Racing, with Oliver Oczycz on helm to take their solid first win of the regatta. A great performance by Davide Rapotez’ Destriero from Trieste who was second to cross the finishing line followed by the current regatta leader Tõniste in third. 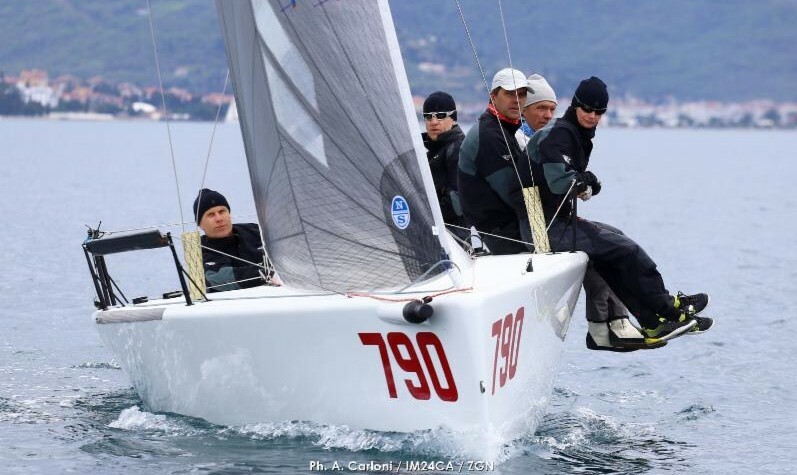 The Hungarian FGF Sailing Team of Robert Bakoczy were fourth and Taki 4 of Marco Zammarchi with Niccolo Bertola on helm were fifth. The competition is tight in the Top 8 overall, with just six points covering them. Miles Quinton’s Gill Race Team with Geoff Carveth on helm has 22 points in fourth place, followed by Akos Csolto’s Seven Five Nine completing the Top 5, one point behind. Thirty boats from Europe represented ten countries in the first event of the season.